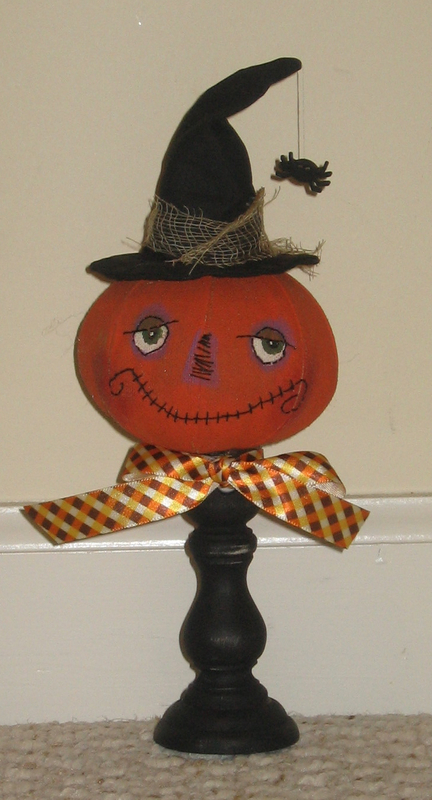 I really love Halloween crafts and I finished my first one this year – Bartleby the Pumpkin! The pattern was in the recent issue of Create and Decorate and I couldn’t resist his grinchy grin. The pattern had more of a party hat on him (made out of paper), so I opted to make a witch’s hat instead with a spider and spiderweb. Of course, his name makes me think of that Herman Mellville story you read in school – Bartleby the Scrivener. Remember that one? It was about poor old Bartleby and all he ever said when asked a question was “I would prefer not to.” He drives his boss crazy, but instead of firing ol’ Bartleby the boss moves to a different building and leaves Bartleby behind! Such a strange story, and one I remember very vividly. UPDATE: Just finished this one as well. This one is larger (if you can’t tell from the picture – it is probably twice as big). Not sure where they both will go yet…. This entry was posted in Dolls and Softies, Holidays, Miscellaneous, Sewing. Bookmark the permalink. Love it !!! This will be a keeper for many Halloweens to come. Heather, PORCH SALE!!!!!!!! Love them!!!! Heather they are fantastic – love them – spooky!! Thanks everyone! Glad you like them. I will plan to make a few for the porch sale :). I love this guy and the story too.